Returning to Laos to visit and to have a ceremony for my late father. How much should we expect to spend? Comments for Returning to Laos to visit and to have a ceremony for my late father. How much should we expect to spend? It's nice of you trying to fulfill your mom's wish. You won’t regret making her happy. I think I can understand your concern about the cost of the ceremony, but if you don’t have a lot to spend, there are ways to keep it within your budget but still have a decent ceremony. My sister just did the same ceremony (quite a decent one) for her late husband a year ago and she spent a total of around US$4,000. She sent out some 300 invitations (this is in Vientiane, in provinces it might be more expensive). Some of material for ceremony (similar to the one in the 1st and 2nd pictures) she got the used ones from temples. You need to give the temples some money, say $50 or so per set instead of buying brand new which costs around $200-$300 per set. At night, for food she used a catering company, an average company that most people use (food+ soft drinks cost $8-$10 per head). Tents, tables, chairs, fans etc. rented from the catering company and they set everything up for you. In the morning, you need food for the monks and for guests as well, but usually smaller quantity than that at night, this can be prepared at home to save a bit if you have the labor. Stuff for alms-giving procession such as sticky rice in banana leaf, she ordered it from a shop or someone who does it for a living. It might be a bit more expensive than preparing it at home, but it saves a hassle. 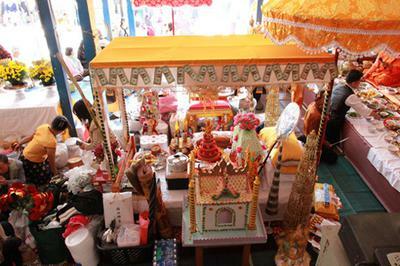 Stuff for alms-giving (as in the 3rd picture), you can buy smaller version or omit it as it’s not obligated. This is just an example, many well-off people do it more luxury and of course that costs way more (more than $10,000). It’s really depending on your preference. 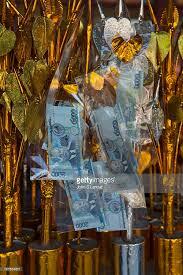 Keep in mind though, guests attending the ceremony will always donate some money more or less. The total amount that all guests donate can often cover most if not all the expenses. You can chose to keep the donated amount to cover the expenses or donate it to the temple, it’s up to you, it’s not wrong if you chose to keep it. For the question: Additionally I am hearing that when visiting relatives it's typical to be paying for them regarding food etc. during your stay. Would it almost be better to stay at a hotel? Well…yes (and no), I think it’s more of personal generousness of individual now. In the past when most of us in Laos were poorer it was true that you’d be expected you pay for their food because you’d be the person with the most money being from the USA. Now many people in Lao are better off, and I’d assume that your relatives also are, if that’s the case I think they won’t expect you to pay, but it’s a nice thing to do though to offer to pay for them, maybe for a special dinner or something like that, but not every meal. Staying at a hotel vs staying with your relatives. Again, it depends how well you know your relatives, and if they’re nice or easy to get along with plus to what extend you're willing to get out of your comfort zone vs saving hotel bill. I’m speaking for myself here, if I don’t know them well and they look like hard to get along with I’d stay at a hotel, but will try to spend as much time as possible with them to get to know them, if they turn out to be good they’d invite you to stay with them anyway and then I’d check out from the hotel (I’m sure they’d say it from the beginning that why do you stay at the hotel, it’s a waste of money why not stay with us etc.). I guess you’d prefer staying at a hotel because most people living abroad value privacy highly. Anyway, it’s just my personal opinion, but hope it gives you some ideas.